Kolkata, Dec 22 (IBNS): Aditya Group celebrated the Annual Day of Aditya Group of Schools through a grand program named GenNext recently at the Aditya Academy Secondary School in Kadambagachi, Barasat. 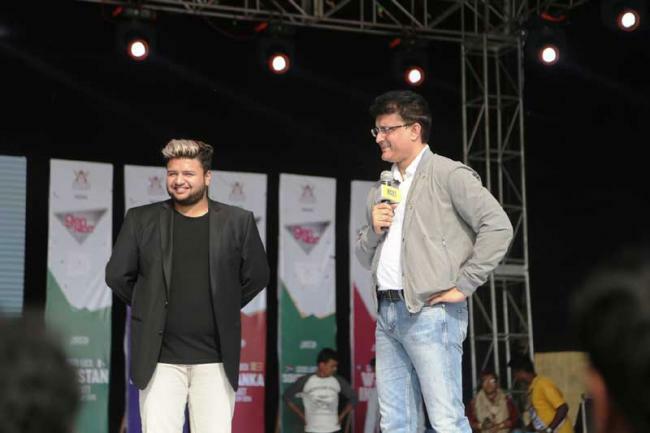 The event was graced by former Indian cricket captain Sourav Ganguly and Avishek Dalmiya, Hony. Joint Secretary of Cricket Association of Bengal (CAB). Ganguly and Dalmiya formally inaugurated the cricket ground newly laid by Cricket Association of Bengal at Aditya School of Sports Cricket Stadium at Barasat, Bengal’s first private cricket stadium. Cricket Association of Bengal has joined hands with Aditya School of Sports for the upkeep of this ground which is expected to host top level matches including 1st class matches from the coming season. This year the theme of GenNext was “ICC Cricket World Cup 2019”. The students were seen performing on various categories of performing arts such as music, dance, fashion walk etc which represented all the nations that are taking part in the next ICC Cricket World Cup 2019. Also present students and alumni were awarded for their exceptional performances and achievement. It was a grand celebration with a crowd of around 14000 visitors including parents, teachers and students. Other eminent members from the Cricket association of Bengal, Blind Cricket Association of Bengal, ex Olympian Joydeep Karmakar and other eminent dignitaries from different works of life also graced the occasion.